We are, for a variety of reasons, not a cow’s milk-drinking household. Back in the UK, there is a plethora of non-dairy options to choose from, but in Japan, milk alternatives are pretty much limited to (soya) bean squeezings and the occasional overpriced carton of rice milk. I am by no means a member of the anti-soy brigade (I’m a non-dairy-consuming vegetarian in Japan, tofu is pretty much on a par with oxygen) but neither do I feel great about guzzling soya milk by the gallon, or it playing too large a role in the toddler’s diet. What, then, to put in tea/on cereal? 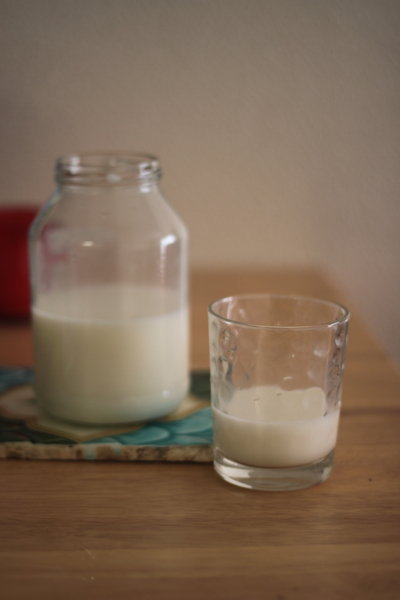 Almond milk appealed – I liked the idea of incorporating more nuts into our diet, rather than another grain or bean, as we tend to consume rather a lot of those in their original forms. It is technically possible to purchase almond milk in Japan, via personal import from the foreign buyer’s club, but it takes a while, and besides, making it sounded more fun. (Spoiler alert: it’s also really easy). Step one: Blanch almonds. For some reason I thought this was going to be difficult. It wasn’t – pour boiling water over almonds, let sit for two or three minutes, drain, rinse in cold water and slip off the skins. 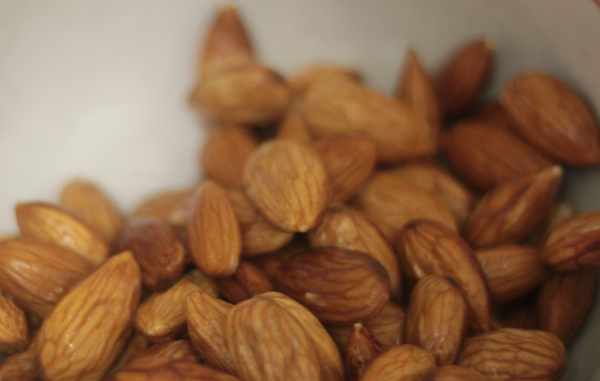 Step two: Soak almonds. I put the nuts in my blender jug along with three cups of water and stuck them in the fridge overnight. Step three: Drain, rinse almonds. Step four: Blend (I used an immersion blender). I used a ratio of one:three nuts:water, which resulted in a fairly thin but not too watery milk. Step five: Strain. I strained three times through a mesh strainer/sieve and then one final time through some “Healthy Cooking Paper”, purchased due to a picture on the package of dashi being strained. 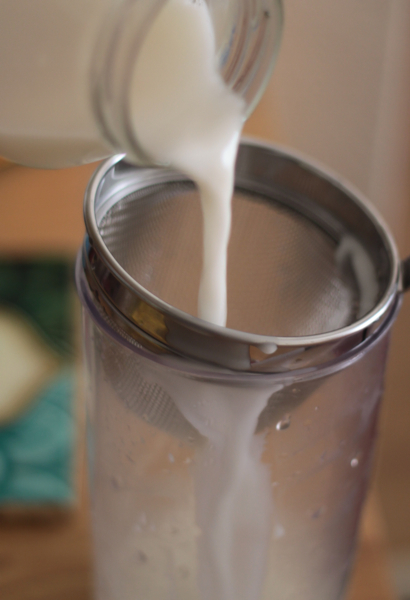 I’m pretty sure almond milk wasn’t what the manufacturer had in mind, but it worked well, although honestly, another go through the sieve would probably have done the job. Some recipes suggest adding a pinch of salt, or a couple of dates, and I think I may do so with the next batch, but it was really pretty good straight up, or – in a rice pudding-y kind of way – with a grating of nutmeg. It made for a thoroughly tasty, toddler-approved banana-strawberry smoothie, too. 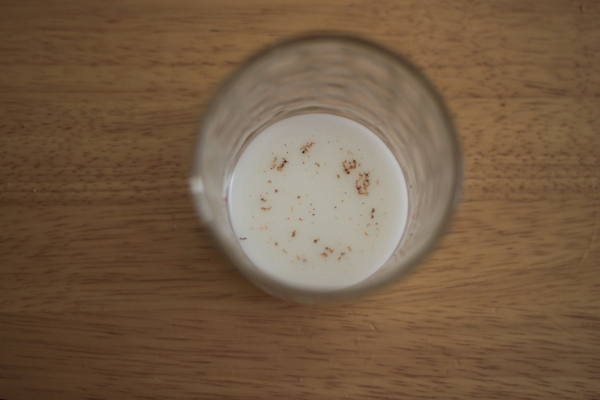 Milk made, the question arose of what to do with the leftover pulp. A quick google revealed a ton of recipes –a whole website even – for using it up. A lot of them, though, required drying, and, in an impatient mood, I decided to simply sub the wet pulp for some of the flour in a batch of oatmeal-raisin cookies, dialing down the liquid accordingly. Despite a poor track record when it comes to making up cookie recipes, they were good – not “here’s the recipe, make them now” good, but perfectly pleasant with a cup of coffee. Much as I enjoyed the almond milk, I am tempted to try my hand next at hazelnut milk, which I’ve only just discovered exists. although it will be a challenge to avoid making a giant vat of this vegan nutella instead. P.S. For anyone looking to make nut milk in Japan, I buy my almonds – and a good deal of my baking supplies – from this rakuten shop, which has a good range of reasonably-priced organic and non-organic ingredients. P.P.S. It took a lot of willpower to make not one double entendre in this post. This entry was posted in Food, Uncategorized and tagged baking, dairy free, food, home, japan, life with the toddler, nuts, recipe, sugar-free, vegan, vegetarian. Bookmark the permalink. I highly recommend making a giant vat of vegan nutella. 😉 Thanks so much for linking to my recipe!